When you prepare your own sauces, creams and condiments, you feel control over your kitchen and over all the ingredients you are using, you can avoid using genetically modified ingredients and replace them for organic and healthy ingredients – and the flavor is almost always much better. When you go to the grocery store, have you noticed that almost all sauces and canned foods contain a lot of modified ingredients? This is bad not only for your own health but also for the health of your entire family. This is when you start to think: “why not? I can make my own sauces and prepare delicious and healthy recipes”. If you do, this is the best decision you can make. Blend all ingredients except for the last 3 in a blender. If using a high-speed blender you may want to pulse until you see tiny chunks of garlic and pepper. You don’t want to completely puree the mixture. Add the mixture to a saucepan and bring to a boil. Lower heat to medium/low and simmer for 3-4 minutes, until sauce thickens. In a small bowl, whisk the cornstarch and 2 tbsp. water until smooth. Add the slurry to the saucepan and shake vigorously until well-combined, usually 1 minute. You should see the garlic bits & pepper bits suspended in the mixture. Take off heat and let cool. Once it’s cooled down, add the salt and stir well. Sauce lasts for a few weeks. Remember that healthy eating is a great start towards a healthier life. You might be wondering now, what is the difference between organic foods and conventionally grown foods? Is “organic” always best? What about locally grown foods? When you say “organic”, that refers to the way agricultural products are grown and processed. Specific requirements must be met and maintained in order for products to be labeled as "organic". This is why organic foods are the best ally for your health. 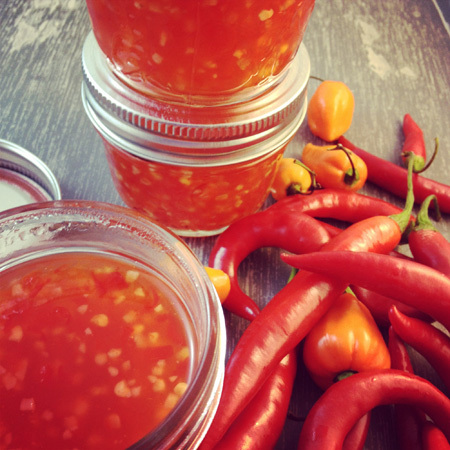 When picking your chilies for this sauce, choose organic and you’ll see how delicious and healthy it is.